Walking, Cycling, and Irish Food Tours of Ireland offered by Caddie Tours of Vienna, Virginia. There is no feeling that is quite as fulfilling as walking through the beautiful Irish countryside with an interesting group of people who share similar interests. It is invigorating, relaxing and spiritual. One's mind, body and soul seem to be nourished in ample and equal proportions. This is travel at its best where you literally have time to stop and smell the flowers. You will return from your Irish walking vacation relaxed, refreshed and maybe with a new perspective on how the world works. On these tours everything is organized and personal service, care and attention to detail are all part of everyday life. The accommodations are selected with great care based on location, ambiance and an introduction to "typical" Irish home-life. Equally the restaurants or pubs chosen are of a very high standard offering a tremendous variety and selection of Irish cooking. Group cycling tours of Ireland allow you to enjoy your daily rides without worries — your equipment is provided, your luggage is transferred, and your routes are set, all you have to do is enjoy the journey. 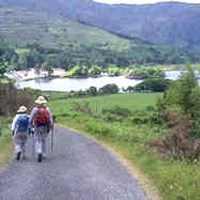 The average daily route is 30–40 miles and allows cyclists to travel at their own pace. There is plenty of time for rest stops, detours, and soaking up the magnificent scenery. Each route should be manageable for all levels and alternate routes are available for the more avid cyclists. Novice riders can take comfort in knowing that the guide will do daily sweeps to pick-up anyone wishing for a break! Irish cuisine offers an adventuresome delicatessen to the palate, from down-home Irish stew and traditional corn beef and cabbage to unusual and exotic dishes such as coddle, a thick and hearty Irish type of stew created with sausages, potatoes and onions, to more unusual dishes such as black and white pudding. Travelers to Ireland must enjoy the adventure of a culinary tour or cooking classes that offer basic and traditional recipes such as Irish Mulligatawny stew to hot cross buns. Many traditional Irish recipes date back to Middle Age times and have changed little in the years since. From Steak and Guinness Pie to Coddle, pheasant or succulent lobster, Irish cooking classes give individuals from around the globe the opportunity to explore and broaden their culinary tastes. Give the taste buds a treat with a Hot Bloody Mary soup or smoked trout pâté. Awaken the taste buds with wine tours offering the best in Irish wines, many of which date back to Celtic times. A cookery vacation in Ireland offers everything from basic potato and lamb dishes to exotic sausages for the more daring in culinary tastes and cooking styles.